Well, I eat pretty poorly, and I am pretty easy to convince to just go out to dinner and forget trying to stay healthy. I have tried to eat more fruits and veggies but, frankly it is just a pain to peel them, cut them up, add them to foods, find recipes that they go into, and its just so much easier to eat poorly. I am not making excuses here, I am simply stating the facts for my life. When Activz contacted me, I was intrigued, they wanted to send me one of their products to review and when I saw that they had whole fruits and veggies in a powder form, I thought it was a perfect match for me. 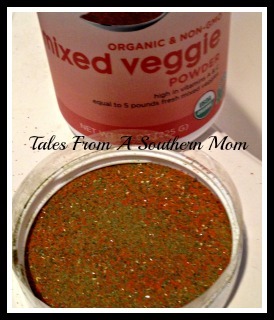 I have since, gotten their organic Mixed Veggie Powder and their Organic Mixed Berry powder. I figured I used the veggies for savory and the berries for sweet dishes, I may just be able to get them into my family’s foods. I made a chicken pot pie and in the gravy mix I added some of the veggie powder and nobody noticed, I knew it was there, but it did not taste like a powder was added to my food, it added a nice flavor actually and made the dish more savory than it already was. One tablespoon of the veggie powder provides 210 percent of the Vitamin A you need daily and it is all from whole foods, carrots, kale, and spinach and they are all organic. You can also add this to your morning smoothie or tomato juice, you can use it to thicken gravies and add an extra boost. One serving of this powder is equal to 1/2 of a cup of fresh vegetables. WOW! That is very cool. So, greek yo gurt is a trend around here lately and I have been trying to buy ones with the least amount of sugar and no high fructose corn syrup. I bought some mixed berry and added one tablespoon of the mixed berries powder and it was great! I loved the taste so much. It added a fresh flavor and enhanced the berries incredibly. I am sure you could add it to plain yogurt, but I did not try it, I am going to put it on my list to do though. In this mix is strawberries, blueberries and raspberries. I have less of a problem getting fruits in my family’s diet but it is hard to get them to eat berries I buy before they go bad. This was perfect, no worries about them going bad. I also baked blueberry muffins and added this powder to the mix. It was fabulous. Now, I know that this may seem like a silly product to some, and frankly when I saw them I was a little skeptical, but I think eating for nutrition is important, and I feel that these powders may make a difference in me getting some fruit and veggies rather than none, I think this is great. Check out the website, they have so many different things to choose from and even a recipe book to use the powders with. If you have toddlers, picky eaters, or you just don’t get enough fresh fruit and veggies in your diet this is a great product for you.